Ferreira, Karen dos Santos, Fabíola Dach, and José Geraldo Speciali. 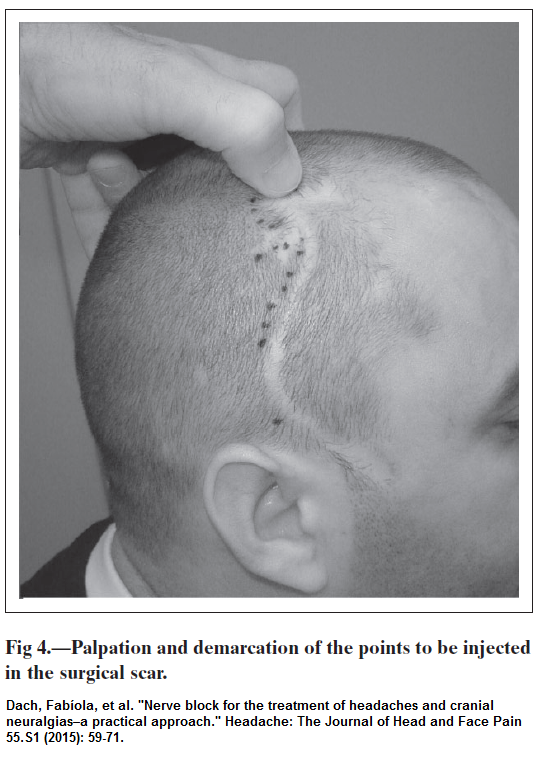 Scar neuromas as triggers for headache after craniotomy: clinical evidence. Arquivos de neuro-psiquiatria 70.3 (2012): 206-209. Nerve block for the treatment of headaches and cranial neuralgias–a practical approach.” Headache: the Journal of Head and Face Pain 55.S1 (2015): 59-71. There may be plenty of triggers as seen in above pic. I also suggest fluid should bleb up skin some as injected. Having said, they move on to blocks if necessary, they don’t exactly say how well treatment goes, but implication was that it goes well but is a lot of work with multiple sites done and blocks to nerves as well. case 2 – severe temple episodes pain lasting minutes – injected points with a solution of lidocaine 2% (1.5 mL) with dexamethasone 10 mg/2 mL (0.5 mL). 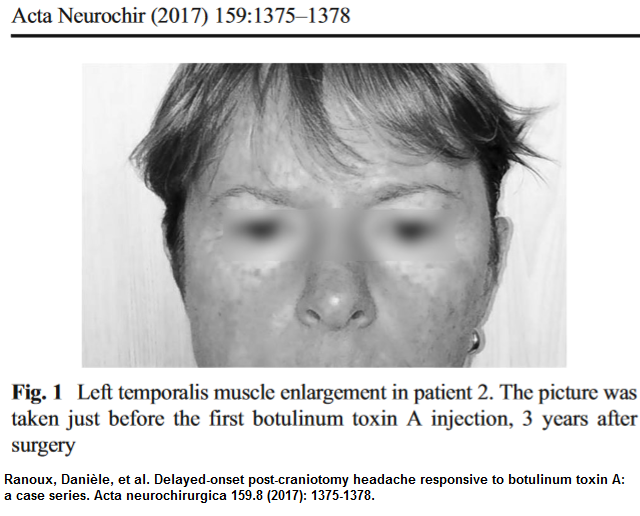 Delayed-onset post-craniotomy headache responsive to botulinum toxin A: a case series.” Acta neurochirurgica 159.8 (2017): 1375-1378. Milan, Spaić, and Aleksić Vuk. Cranioplasty for the Relief of Chronic Pain: 70 Years after the Debridement of the War-Penetrating Craniocerebral Injury. Indian Journal of Neurotrauma 14.01 (2017): 043-045.
repeated injection of post craniotomy patients either locally or nerve root blocks can make a major difference. Injecting neuralgic areas with botulinum by self may not reduce the problem but the areas are then more easily deadened by local/steroid blocks after. I found this out working with a case of occipital neuralgia. I would inject tender nerve and areas with botulinum and then in ensuing weeks inject with 5% local with control of symptoms for up to 12 weeks. This has worked for 17 years despite him working hard “grunt” labor jobs. I would not inject 5% in a post craniotomy area though. number of areas needing injecting, according to picture is daunting but apparently well worth it. This entry was posted in Headaches, neuropathic. Bookmark the permalink.